Social scientists do much of their work with little fanfare; some make names for themselves as experts on specific areas of concern, but most have a small sphere of influence. Harvard political scientist Robert Putnam is a notable exception whose work reaches far beyond typical academic circles. His 1995 article "Bowling Alone: America's Declining Social Capital" and later book of the same title captured the imagination of many intellectuals and vaulted the term "social capital" into the national lexicon. Putnam's work has earned him national and international acclaim, including opportunities to meet and consult with three US presidents as well as other world leaders. 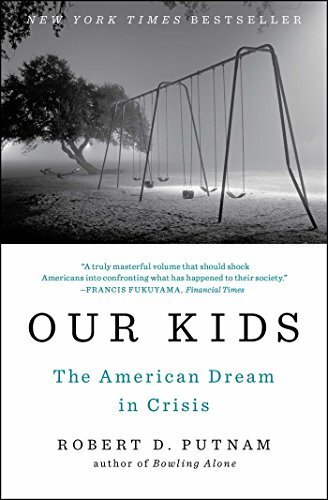 Putnam's latest work, Our Kids: The American Dream in Crisis, shines a spotlight on a complex and vexing issue that many Americans would rather ignore: the growing opportunity gap in the United States. He questions if the American Dream is still within the grasp of most Americans, pairing stories from interviews with young adults and their families with decades of quantitative data on a wide array of measures of social and economic mobility and well-being. Especially in the wake of the Great Recession, much ink has been spilled highlighting the widening gap between rich and poor. As politicians, pundits, and professors have been quick to point out, 99 percent of Americans have lost economic ground in recent decades. In terms of wealth and income, only the top one percent of households have seen economic gains. The richest are getting even richer, and almost everyone else is losing. These numbers are unsettling to be sure, and economists are right to draw collective attention to the trends. But a focus on the 99 percent risks missing the widening and increasingly intractable gaps between socioeconomic classes, important pieces to the much more complex puzzle of inequality in America. Putnam's new book challenges readers to consider the implications of inequality from multiple vantage points, and his findings should cause people across the ideological spectrum to squirm. Instead of looking back to see what has happened once a generation has reached the end of life, Putnam looks forward to investigate what is happening to children right now and in recent decades to see what it portends for the future. Although he acknowledges growing inequality in income and wealth, he sees equality of opportunity, not equality of outcome, as the best proxy for whether America is living up to its ideals. He also contends that relative mobility (whether members of society are free to move up and down the socioeconomic scale) is a better measure of societal wellbeing than absolute mobility (whether society as a whole is becoming more wealthy), provided absolute mobility is modestly positive. In many ways, Our Kids picks up where Bowling Alone left off in chronicling declining social capital in America, but this time with a specific look into the breakdown of community and family structures and the resulting opportunity gap between children of different socioeconomic groups. Putnam worries that we no longer feel a collective concern for the next generation but instead think in terms of "my kids" or "your kids," "rich kids" or "poor kids." He calls his readers to look anew at America's youth and their struggles, seeing them all as "our kids" for whom we have responsibility. Throughout the book, Putnam reflects on his own experience growing up in the small town of Port Clinton, Ohio, a place he describes as "a passable embodiment of the American Dream"—the sort of place, he fears, that no longer truly exists today. He opens the book with a look at how his hometown has changed since his childhood in the 1950s. He surveys his high school classmates, who came of age in a time of upward mobility, an "era of full employment and strong unions." He finds that three out of four of his classmates are more educated than their parents, most of the men (but few of the women) earned college degrees, the community provided significant support, and socioeconomic class made little difference for economic advancement. Putnam then fast forwards to present-day Port Clinton, where a factory, mine, and Army base have all closed. He describes a bleak community marked by high unemployment and despair. The mixed income, close-knit Port Clinton community of Putnam's childhood has stratified into high-income neighborhoods along Lake Erie and high-poverty areas inland. Between 1970 and 2010, the number of single-parent households doubled and the divorce rate rose fivefold. Broadening his focus beyond Port Clinton, Putnam devotes the rest of his book to its animating question: "Do youth today coming from different social and economic backgrounds in fact have roughly equal life chances, and has that changed in recent years?" Putnam wrestles with this puzzle in chapters that examine how families, parenting, schooling, and communities are changing. The data reveal stark differences in family structure, with a two-tiered pattern emerging of traditional and "kaleidoscopic" families. Higher-educated households are much more likely to include two parents, whereas in the lower-educated tier, childbearing is no longer linked to marriage and family structures are more fragile. Putnam suggests that economics, culture, and mass incarceration all contribute to these changes. Widening income segregation means that poor children's schools and communities reflect the instability common in their families. Schools' and teachers' attitudes toward achievement (or lack thereof) morph to match their students' orientations toward success and failure. One low-income student laughed when asked about the quality of education at her school, saying, "What's academics?" The networks so essential for success—what Putnam calls "weak ties" between parents and other community members who may be teachers, doctors, lawyers, or pastors—have become much weaker in low-income communities over the past few decades. The book relies on qualitative and quantitative data to unpack various elements of its thesis. Putnam's research team conducted in-person interviews over two years, ultimately interacting with 107 young adults and their families from 10 cities and towns across the country chosen to represent different local economies and cultures. The researchers sought to create "quartets" of interviews in each location, pairing a workingclass youth and parent with an upper-middle-class youth and parent. The team found their respondents in a variety of ways. Often, they used local connections to suggest contacts. They also describe some "on the ground" recruiting, looking for possible respondents by spending time in teen hangouts. After the interviews, the team followed up with respondents through Facebook. Each data chapter opens with a quartet of qualitative interview stories and then reports on quantitative data related to the subject matter. The book introduces readers to young adults and parents at five of the research sites, skillfully weaving narratives that reveal deep and complex divides between the higher and lower income families in each city. The interviews and the real-life stories they reveal add great depth and richness to the book. But they also raise methodological questions. Would the stories and patterns look different in other areas of the country? The stories highlighted in the book fit quite neatly with the quantitative data. Did the many interviews left out of the book tell similar tales? Although the compelling and often heart-wrenching stories that open each chapter are most likely to capture readers' attention, the reviews of quantitative data that follow the vignettes are more impressive. Putnam brings together data from a wide and interdisciplinary array of studies to build a compelling narrative. Over and over again, the data sort into what Putnam calls "scissors charts." Most charts begin around 1960 and show small differences between upper and lower income families that widen with each decade until the two lines look more like an open pair of scissors by 2010. The patterns show low- and high-income Americans moving farther apart on a variety of indicators besides wealth, but Putnam tries to avoid assuming that inequality of outcome indicates inequality of opportunity. Though his explanation of the dismal state of absolute and relative mobility is heavily qualified, Putnam's warning that measures of social mobility are necessarily three to four decades past their time suggests that things may be even worse than the data show. He contends that our current perception of the American Dream is myopic. When Americans who have climbed the economic ladder reflect on their life progress, they tend to emphasize the difficulties overcome along the way while paying far too little heed to their relative advantage and the helping hands they were offered. But brains and hard work still matter more than status, even if inherited economic standing plays a bigger role than it used to, right? Putnam introduces much data to suggest that, even though we shouldn't expect all children to climb onto the economic ladder at the same rung, they aren't even getting on with equally sound footing. Consider this hard-hitting statistic: poor kids with high test scores are now less likely to complete college (29 percent) than rich kids with low test scores (30 percent). The case for the dying Dream is compelling indeed, even if the chances of just anyone going from rags to riches were never as good as we would like to think. Putnam's focus on socioeconomic status dominates his analysis, so he only occasionally considers the role of race. Here his voice becomes more optimistic as he offers hopeful data that black children face fewer barriers to educational and economic success than their parents and grandparents did. Gaps between racial groups are indeed narrowing on many measures, if slowly. But racial discrepancies remain and deserve further analytical attention. William Julius Wilson commented to Putnam in a panel at the American Enterprise Institute that "if I have one quibble with your book, I don't think you devote sufficient attention to the continuing interracial disparities." The book would be more powerful if it delved deeper into the underlying causes and continued repercussions of racial differences on a wide range of factors that contribute to social mobility. One thing Putnam makes clear is that although racial gaps are narrowing, class gaps are growing within each racial group. The book's interviews in particular reveal that class is supplanting race when it comes to inequality of opportunity. Housing segregation is increasingly predicated on social class rather than race, creating what Putnam calls a "perception gap": "[F]ewer and fewer successful people (and even fewer of our children) have any idea how the other half lives." Furthermore, he argues that the thickening hedges between the path to success and the path to failure are eliminating cross-traffic between the two. Liberals and conservatives alike will find much to agree with and much to dispute in Putnam's final analysis. Both outlooks are rooted in important truths and, despite what many want to argue, are not mutually exclusive. Those on the left are correct to highlight structural and institutional barriers impeding social mobility. Safety-net programs are essential, as are efforts to challenge structures and systems stacked against the poor and less educated. But those on the right are also correct when they point to the importance of hard work and individual choices. Factors like marriage and out-of-wedlock births matter; some choices open doors even as others close off opportunities. If one wants to play the blame game, Putnam's account of declining opportunity makes for tough fodder as it highlights the failures of both the rich and the poor. It's easy to raise a battle cry about wealth inequality and the 99 percent. But it is much harder—and much more crucial—to take a close look at the growing disparity in opportunity between large swaths of the American public. Generations are trapped in vicious cycles that need to be reversed. The factors most likely to perpetuate inequality of opportunity are deeply entrenched and vexing to address. No single political party or group of actors can effectively reverse these patterns alone. A complex web of economic and cultural shifts has contributed to the problem, and the paths to solutions will be multi-faceted and highly demanding. Any way forward will require sacrifice, a concept all too absent in contemporary culture. Who better to model a way back toward robust community and genuine care for others beyond our immediate circle than the church? Yet comments Putnam has made in other venues reveal a particular blindness to the depth and scope of work being done by "organized religion." In an interview with the Washington Post's Michelle Boorstein, Putnam said that faith leaders are "missing in action" in the fight against inequality. He went so far as to say that the "fact" that people of faith spend all their funds fighting abortion and homosexuality rather than relieving poverty "is the most obvious point in the world." In saying so, he ignored not only accounts from his own book but also years of philanthropy data that show Christian organizations spending billions of dollars annually on global and domestic poverty relief. Likewise, careful reading of Our Kids reveals that while systemic solutions to inequality of opportunity are not forthcoming, some positive interventions are taking place in the lives of individual youth and families. When Putnam's interviewees do reference help received from churches, teachers, or others, he tends to treat these occurrences more as strokes of fate than as the result of deliberate actions by people of faith or others seeking to do good. While Putnam pays too little attention to the efforts churches and individual Christians are already putting forth to fight poverty and strengthen communities, he is right that these efforts have not been enough to squeeze the scissors on his charts. While efficacy is no measure for faithfulness, Christians should accept Putnam's call to even greater social stewardship. Putnam is on point when he notes the power of organized religion to make a difference in American culture, telling Boorstein that "without the voice of faith, it's going to be very hard to push this to the top of the agenda." Putnam doesn't elaborate on actions and policies to reverse these troubling trends, perhaps because he's seen enough of the data to realize the depth of the problem. We in the church are equally unlikely to find simple fixes, but we can make a difference. As his research poignantly shows, all children and young adults need physical and emotional security, consistent parenting, education that develops mind and soul, and access to meaningful networks of adults who can help them along the way. When any of these essential pieces break or crack, churches and faith-based organizations are well positioned to stand in the gaps. Faith communities have an essential support role, and they should continue efforts to provide safe places for parents and children to share their struggles and get practical and substantive help. Congregations also foster the meaningful networks so essential for developing life skills. But churches must also reach beyond their own communities, forging substantive and thick partnerships that cross barriers of socioeconomic status and race. Willingness to bridge social and racial divides has long been a potential yet all too sporadic mark of Christianity, and the growing opportunity gap offers yet another call to serve. The task is daunting, but churches and faith-based organizations are uniquely placed to extend grace and help the needy in ways that could make meaningful differences in the lives of our kids. Putnam describes what ails American children in evocative prose and with telling quantitative data. If his conclusions are on track—and we have every reason to believe they are not far off—the future for the next generation looks grim. We are quickly moving toward two Americas, one of prosperity and advantage and one of cyclical poverty and despair. Putnam's bleak statistics present the church with a great challenge but also a great opportunity to help reverse these troubling patterns. Amy E. Black is professor of political science at Wheaton College. She is the editor of Five Views on the Church and Politics (Zondervan). Kira Dittman is a senior political science major at Wheaton College.